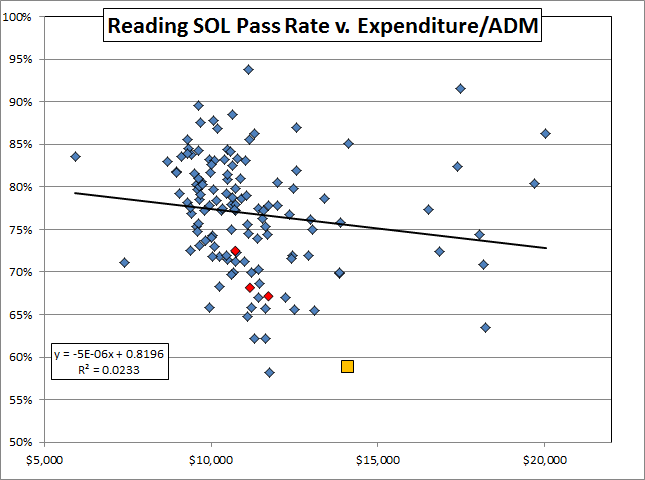 In the past, I have demonstrated that Richmond was paying a lot of money for poor SOL results. 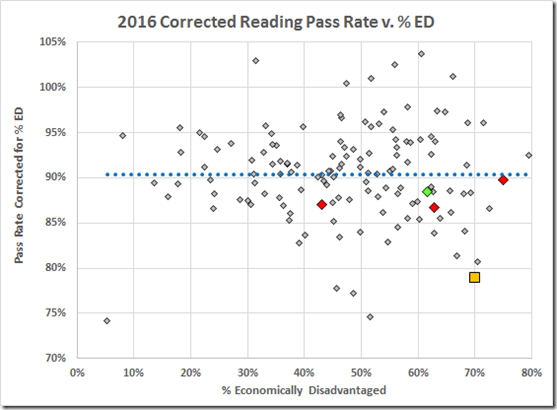 This year, in light of our Superintendent’s complaints about his customer base, I’ve demonstrated that our SOL scores are awful, even after correcting for the economic disadvantage of the student population. to the actual pass rates to level the playing field. Note: The gold squares are Richmond; the red diamonds, from the left, are Hampton, Newport News, and Norfolk; the green diamond is Charles City County. 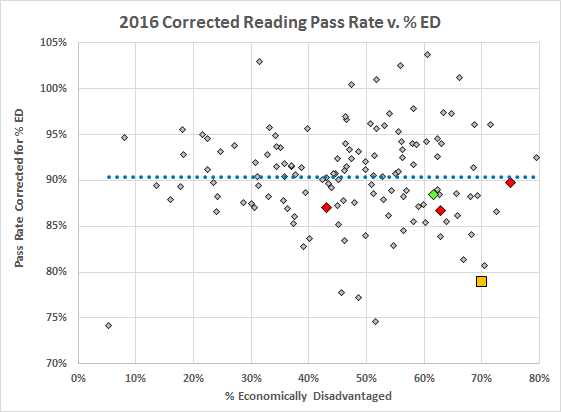 On the reading data, this produces an average adjusted score of 90.4, which is the intercept of the fitted line, i.e., the pass rate extrapolated to 0% ED. 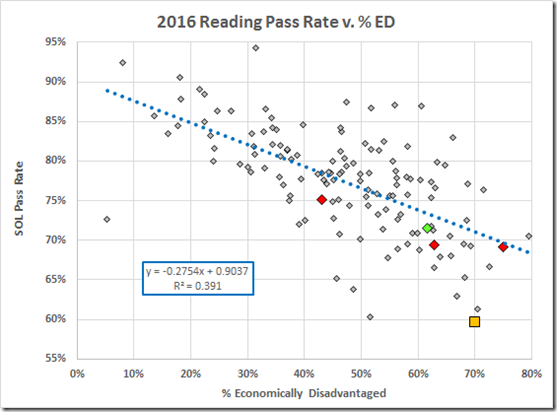 Said otherwise, it expresses each division’s pass rate as the actual rate increased by the disadvantage posed by the division’s percentage of economically disadvantaged students. As to cost, VDOE will not post the 2016 data until sometime this Spring so we’ll have to make do with 2015 data, here the disbursements per student. 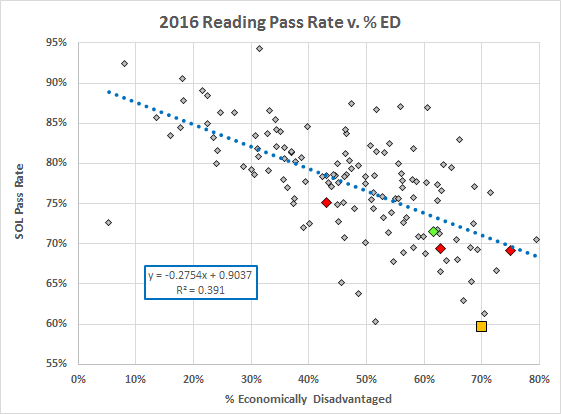 On that basis, here are the 2016 division average reading pass rates, corrected for the ED of the division, plotted vs. the 2015 division disbursements per student. The fitted line suggests a slight increase in score with disbursement but there is no correlation. That is, spending more per student is not correlated with better pass rates (adjusted for ED, so the divisions with more poor students are not disadvantaged). Richmond (the gold square) underperformed and overspent its peers, Hampton, Norfolk, and Newport News (the red diamonds, from the left, ), as well as our neighbor, Charles City County (the green diamond). 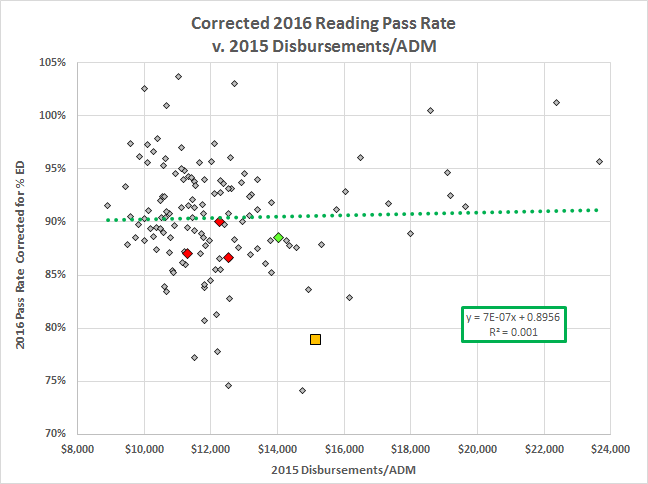 Three of those six divisions with adjusted pass rates > 100% (i.e., > 9.6 points above the 90.4 adjusted average) were spending < $12,000 per student; all spent less than Richmond’s $15,155. The math data paint much the same picture. 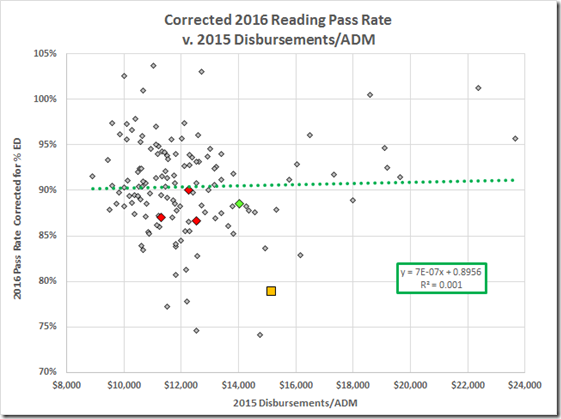 Here the slope might suggest a negative correlation between pass rate and disbursement except that the R2 again tells us that there is no correlation. 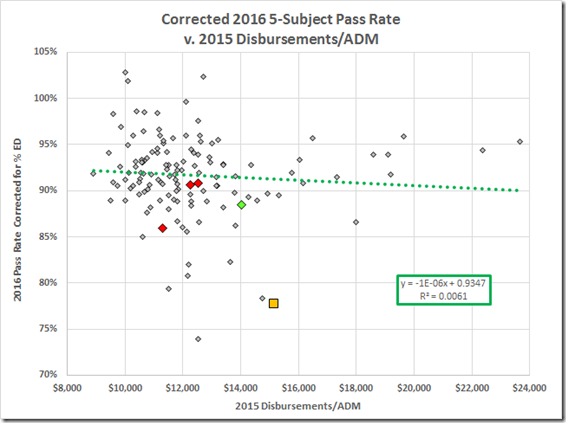 Richmond again underperforms, expensively. The five subject average tells the same story. 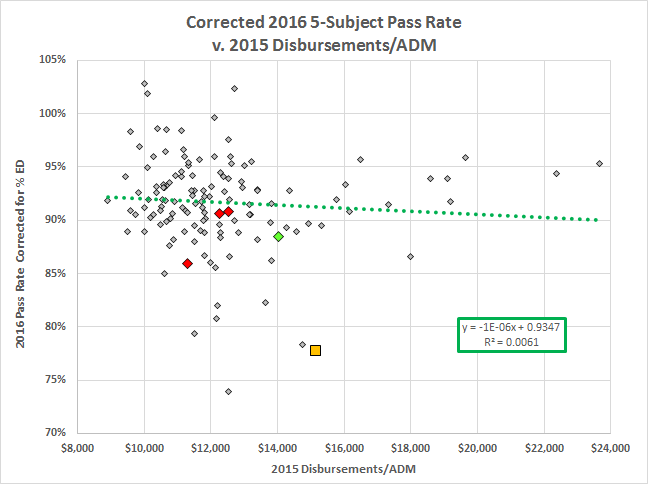 To state the obvious: Richmond schools don’t need more money; they need competent management.